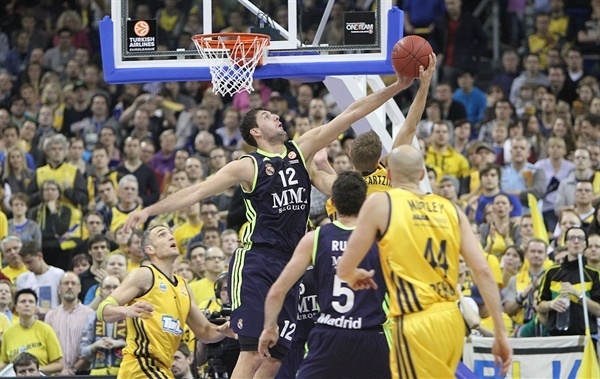 Real Madrid opened the Top 16 with an important 63-77 road win over Alba Berlin at o2 World in the German capital. The visitors led for nearly the entire game spare for a brief stretch in the second quarter. Nonetheless, the hosts battled hard, kept it close throughout and closed the gap to 57-60 early in the fourth quarter before the hosts pulled away to close out the win. Sergio Llull paced Los Blancos with 15 points and 6 assists, while Rudy Fernandez, Nikola Mirotic and Jaycee Carroll added 13 points apiece. 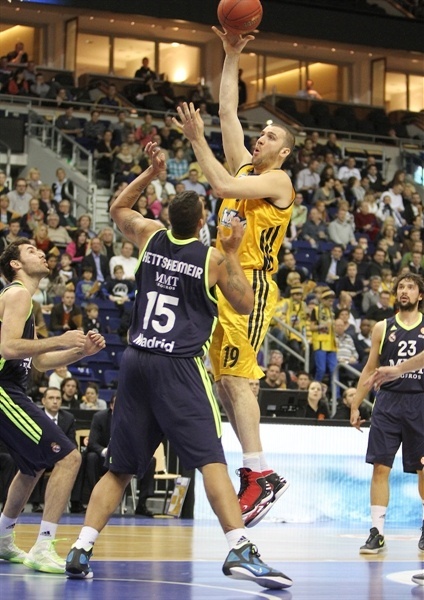 Rudy also had 7 rebounds and 4 assists for Madrid, which benefitted from 20 Alba turnovers. 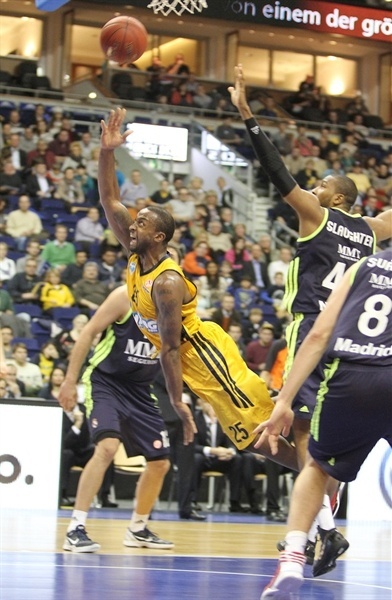 Albert Miralles netted 14 points and JeKel Foster scored 10 in his first Euroleague appearance for Berlin. 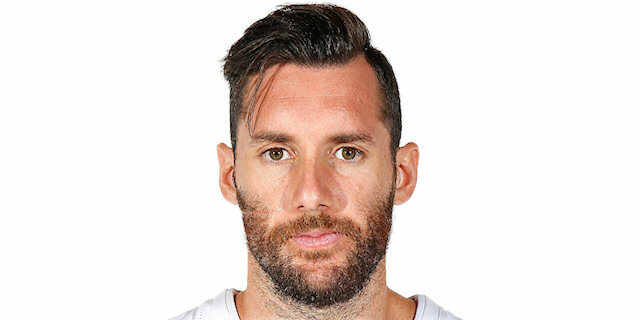 Mirotic stood out early for Madrid with the game’s first points on a hook shot, a pair of defensive rebounds and a three from the elbow to make it 0-7 before Yassin Idbihi went inside to get Alba on the scoreboard. Rafael Hettsheimeir’s second basket was followed by a Llull three to put the visitors ahead by double figures, 2-12, after four minutes. After a timeout, Berlin went with a smaller lineup using Derrick Byars at power forward and promptly scored twice through guards Foster and DaShaun Wood. However a triple by Rudy kept Los Blancos in control. Foster created a highlight when he regained a lost ball and scored a layup-plus-foul, which made it 11-18 and sent Hettsheimeir to the bench with 2 fouls. Sven Schultze’s jumper narrowed the gap to 5. The teams traded scores over several possessions before Mirotic, with a block at one end and a layup at the other, made it 17-26. 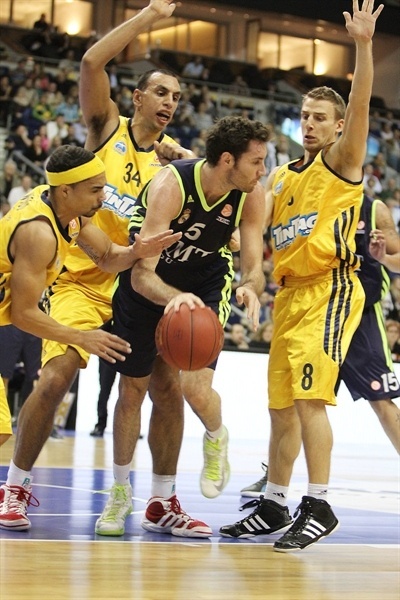 Mirza Begic fouled Miralles twice in 20 seconds, which led to 3 free throws and a 20-26 score through 10 minutes. Zach Morley dished inside to Miralles to bring the hosts within 4 early in the second quarter. Despite a layup by Llull, Idbihi added a baseline jumper and Deon Thompson first basket came with a one-handed shot in the paint to close the gap to 26-28. Sergio Rodriguez found Felipe Reyes down low for an easy 2, but Byars countered from downtown to make it a 1-point game. 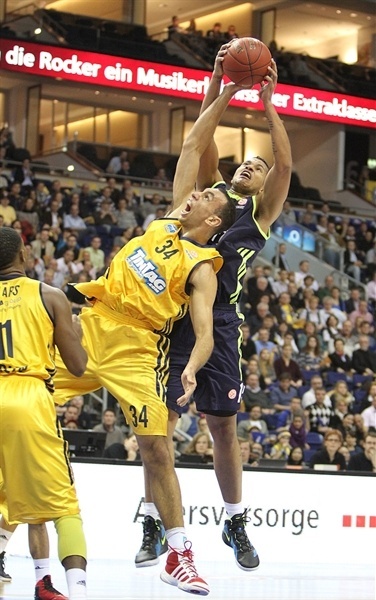 Free throws by Marcus Slaughter and Carroll gave Madrid a bit of breathing room, but the Berliners struck back quickly. 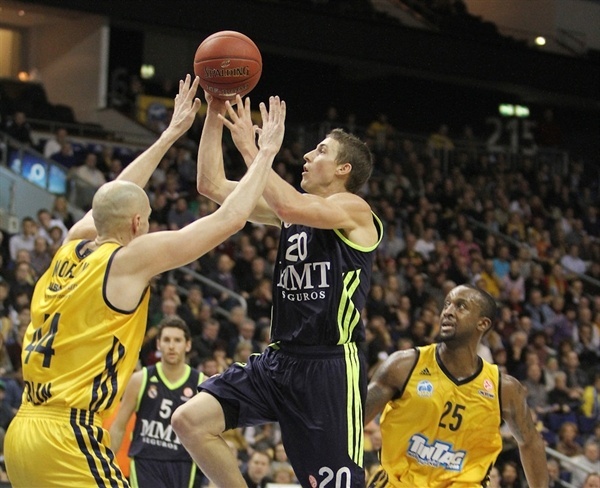 A basket by Morley followed by a Heiko Schaffartzik triple gave Alba its first lead, 34-33, as o2 World kept rocking. With the pressure on, Carroll showed up for Madrid with 5 consecutive points. A pair of missed open threes kept Madrid from extending the lead, but the visitors kept a 34-38 advantage at the break. Hettsheimeir scored on the opening possession of the second half and fouled Schaffartzik on the second possession. Schaffartzik fed Byars for a three from the corner as Alba remained close. However another efficient basket by Hettsheimeir and a Lull triple lifted the Whites to a double-digit edge and Rudy added a triple for a 37-50 lead. Miralles ended the Madrid run with a jump hook and Foster pulled up for a three to keep the crowd involved. Miralles muscled his way to a three-point play and Hettsheimeir’s fourth foul. A third three by Rudy kept Madrid up by 10, 45-55. Thompson corrected his own miss to bring the hosts within 6. Alas a Mirotic slam after a lost Berlin ball and a Llull triple carried Madrid to a 49-60 advantage. Berlin continued to fight; Wood made free throws and then assisted to Schultze for a basket-plus-foul to bring Alba within 54-60 at the end of the quarter. Wood rifled in a triple as the tension continued to build. Sergio Rodriguez hit a jumper to stave off the hosts. Madrid was unable to capitalize on an unsportsmanlike foul called on Byars against Marcus Slaughter, but Carroll answered the call to make it 57-64. Miralles and Reyes traded baskets midway through the fourth quarter. A steal and layup by Rodriguez extended the lead to 9 and led to a Berlin timeout. Rodriguez capped another fastbreak with a layup as o2 World fell silent. Wood’s free throws were matched by Carroll as the visitors held strong. Slaughter helped ice the win with a pair of offensive rebounds to kill the clock inside of two minutes and a Mirotic triple from the corner with a minute to go ended all doubt as Los Blancos marched to the first win of the Top 16. 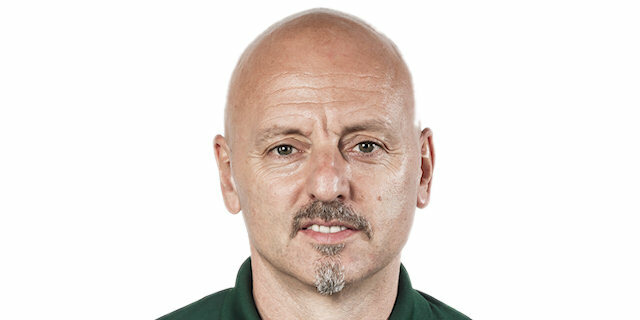 "There is no doubt, that the better team won today. To beat Real, which is among the top four favorites to win the Euroleague this year, we had to have a perfect game, which we did not have today in the small details. And when you play a big opponent, these small details become big. A few turnovers too many prevented us from coming into a situation to make the game more interesting. But I am not unsatisfied with the way we played under difficult circumstances. Deon Thompson was sick from a virus and did not feel good for the game and Nihad Djedovic was sidelined. But we saw that with our newcomer Je'Kel Foster we can have an advantage in the games to come and we have to stay patient in this group." "I think we saw a different performance from what everybody expected from Real Madrid. Everybody is talking about our offensive game, but today we did a very good job defensively containing Alba on the important points of their game. We stooped Schaffartzik and Wood, but they were able to find their baskets inside with Albert, whom I know very well, because I coached him. They always fought to stay in the game and in the end the difference of the game does not give a real picture of how hard we had to work to win this game. Knowing that the first game of a group always is difficult and that it is not easy to win here, this was an important victory for us." "I think that we played a good game and competed almost throughout the whole game. But in the end we lost our focus, which also was a result of Real Madrid's defense. They really have a big team. 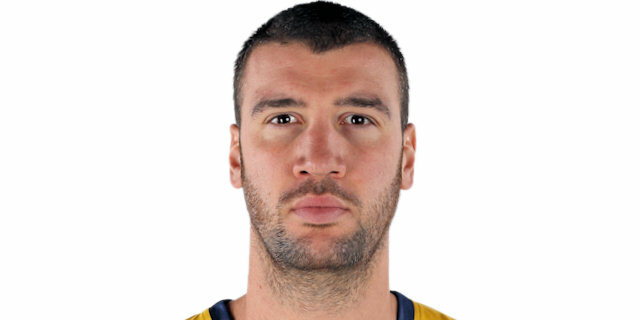 They are one of the teams that can win the Eurolegaue and they were really better in the last quarter." "It was a physical game, in which Alba played more physical. They stayed in the game with their defense, but in the second half we played more aggressive, too. We are very happy about this first victory in our group. For sure, I am not at 100 percent again after my injury, but I feel better from day to day."